Santiago is the final destination for most walkers on the Camino, but over the centuries many have continued their walk all the way to Cape Fisterra, considered to be the ‘End of the World’. The name of Fisterra, on Galicia’s Atlantic Coast, comes from Finis Terrae, the Latin name given to this land by the Romans, meaning ‘Land’s End’. CaminoWays.com walk & swim trail is a relaxing holiday and an invigorating experience. Combining coastal paths with stunning scenery, accommodation at charming guest houses and swimming at beautiful Atlantic beaches, this latest CaminoWays.com package has something to suit even the most discerning holiday maker. 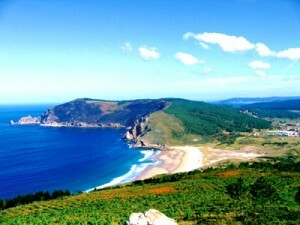 You will start your adventure in Cee, from which you will walk to Cape Fisterra. On your first night in Cee you will stay in a 2* hotel, located in the heart of the town and 50m from the beach. Your second day will see you reach Fisterra where you will have the chance to stay in a 2* lighthouse hotel overlooking the Atlantic. On your third day you will continue your trek, eventually reaching Lires, where you will stay in Casa Rural As Eiras. Here you can enjoy swimming and sunsets on the beach. Your fourth day of walking will bring you to the town of Muxía, located along the Costa de Morte. Here you will stay in Hostal La Cruz on the village seafront where you will also find some of Galicia’s best shellfish and seafood. The fifth day of your trip will see you arrive in Santiago de Compostela where you will enjoy a pampering 2 night stay in the 4* San Francisco Hotel Monumento. This former monastery features a swimming pool and is located just 150m from Santiago’s famous cathedral. During the day you can experience the city’s lively atmosphere and rich heritage by exploring Santiago’s old town, a UNESCO World Heritage Site since 1985.If you would like to walk to the ‘End of the World’ then book your trip now with CaminoWays.com, the walking and cycling holiday specialists, from just €539pps. Please note: Price does not include flights, bus ticket to Cee or bus ticket from Muxía. Book today by logging onto caminoways.com or call 353 (0)1-525-28-86. Find CaminoWays.com on Facebook: facebook.com/caminoways.